Employee engagement is undoubtedly paramount to a successful workplace, but the big question is: how do you create an atmosphere that enables happy and productive employees? In other words, how do you ensure your employees are engaged with not just their work, but their colleagues, their responsibilities, the workplace itself and its core business values? There are big changes businesses can make to their overall strategy, which some might think as the epitome of employee engagement – for example, flexible working policies might bring about more productivity amongst the workforce, or perhaps physical changes to the layout of the workspace, such as facilitating activity-based working, can help improve morale and focus. But sometimes, everyone just want a bit of fun; to have a laugh, and take time out from the daily rigmarole of work. Sunita Pachova, Business Development Manager from Condeco enjoying the healthy breakfast. After all, taking a break, laughing and getting the blood pumping are all recognised ways to improve our brain function and concentration, which can only be a positive on employee engagement levels. There are plenty of activities and programmes which can offer your workforce a little something extra, the quirkier the better. For the perfect example of thinking outside the box, take Condeco’s recent activity Bike for your Brekkie, which we held at the offices of our friends at Oktra, over in Holborn, Central London. What is Bike for your Brekkie? 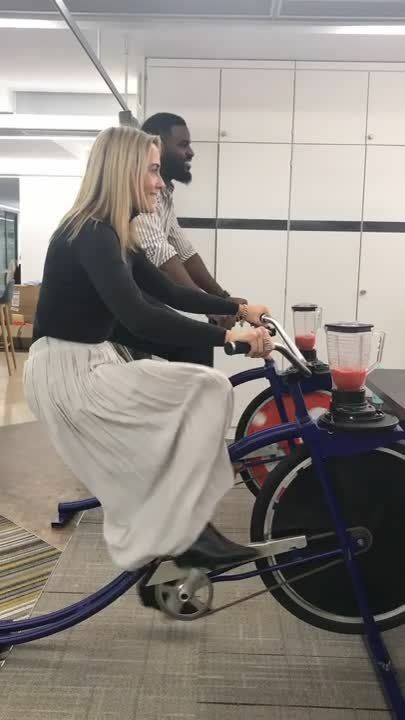 Employees competed against each, making their very own fresh fruit smoothie as they rode, on specially designed stationary bikes, to win the company high-score! Not only was Bike for your Brekkie a fun way for Condeco employees and Oktra to engage with each other, it also had added health benefits of a little bit of exercise, an opportunity to practise hand/eye coordination, and of course, that all-important dose of healthy competition! Condeco's Lisa Nolan and Jason Adaje battling it out for top spot! The aim of game is not to be the speediest, but rather, to execute perfect skill and timing. This ensured that across the workplace, it was an open playing field, as everyone was able to fairly compete, no matter their ability. The atmosphere was fun and light-hearted as the team competed for the accolade of top score (and a mystery prize). This activity, which we can say was indeed a little quirky, and certainly outside the box, helped boost employee engagement levels, with our workforce having plenty of fun while finding themselves better connected to our brand partnerships and company values. Big thanks to the team at Oktra for their engagement and participation!